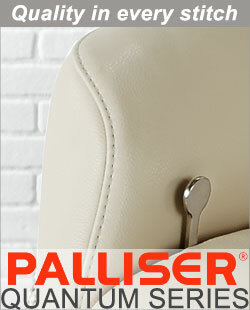 Because the Palliser Quantum Model 50005 is custom made to order, you get to choose from more than 100 leather colors. The Q50005's unique 360-degree swivel chrome swivel base gives this chair a very clean modern style. The State of Style and Comfort. Swivel base with smooth recline and infinite locking positions for customized comfort. Back pivots and headrest adjusts to fine-tune head position. The seat remains stationary when reclining to maintain ergonomic position. Angled footrest keeps legs in a natural position. The Q50005's all steel frame uses No Sag Spring Suspension in the seat for superior comfort and support. Luxurious, ergonomically designed seating surfaces, sculpted from High Resiliency Cold Molded Foam along with strong lumbar support and adjustable headrest make the Q50005 as comfortable as any recliner made. It is an elegant addition to any area in your home and is an excellent investment in comfort and quality. The Q50005 also features Palliser's NEW adjustable headrest that can be pulled forward or pushed back into any position you chose. It provide precisely the support needed for your head and neck and it's ideal for home theater viewing! As the largest maker of leather furniture in North America, Palliser Furniture's Euro Style leather recliner and ottoman sets provide you with the custom comfort and quality of Scandinavian made chairs that can cost more than twice as much!